In contemporary business corporations, the main external stakeholder groups are shareholders, debtholders, trade creditors, suppliers, customers, and communities affected by the corporation’s activities. Internal stakeholders are the board of directors, executives, and other employees. Ways of mitigating or preventing these conflicts of interests include the processes, customs, policies, laws, and institutions which have impact on the way a company is controlled. A related but separate thread of discussion focuses on the impact of a corporate governance system on economic efficiency, with a strong emphasis on shareholders’ welfare. Principles of corporate governance include rights and equitable treatment of shareholders, interests of other stakeholders, role and responsibilities of the board, integrity and ethical behavior, and disclosure and transparency. stakeholders: A corporate stakeholder is that which can affect or be affected by the actions of the business as a whole. Auditing: The general definition of an audit is an evaluation of a person, organization, system, process, enterprise, project or product. The term most commonly refers to audits in accounting, but similar concepts also exist in project management, quality management, water management, and energy conservation. Corporate governance is the system by which companies are directed and controlled. It involves regulatory and market mechanisms; the roles and relationships between a company’s management, its board, its shareholders, and other stakeholders; and the goals for which the corporation is governed. In contemporary business corporations, the main external stakeholder groups are shareholders, debtholders, trade creditors, suppliers, customers, and communities affected by the corporation’s activities. Internal stakeholders are the board of directors, executives, and other employees. Redisigning corporate governance: Corporate governance deals with the conflicts of interests in a company. Much of the contemporary interest in corporate governance is concerned with mitigation of the conflicts of interests between stakeholders. Ways of mitigating or preventing these conflicts of interests include the processes, customs, policies, laws, and institutions which have impact on the way a company is controlled. An important theme of corporate governance is the nature and extent of accountability of people in the business. A related but separate thread of discussion focuses on the impact of a corporate governance system on economic efficiency, with a strong emphasis on shareholders’ welfare. 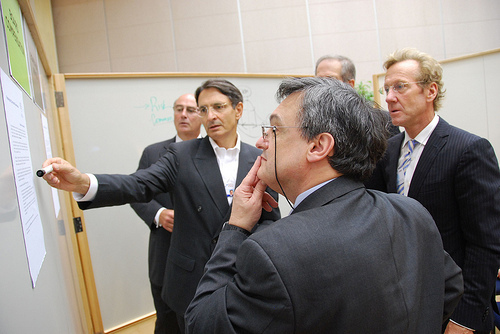 In large firms where there is a separation of ownership and management and no controlling shareholder, the principal –agent issue arises between upper-management (the “agent”) which may have very different interests, and by definition considerably more information, than shareholders (the “principals”). Rather than overseeing management on behalf of shareholders, the board of directors may become insulated from shareholders and beholden to management. This aspect is particularly present in contemporary public debates and developments in regulatory policy. Contemporary discussions of corporate governance tend to refer to principles raised in three documents released since 1990: The Cadbury Report (UK, 1992), the Principles of Corporate Governance (OECD, 1998 and 2004), the Sarbanes-Oxley Act of 2002 (US, 2002). The Cadbury and OECD reports present general principals around which businesses are expected to operate to assure proper governance. The Sarbanes-Oxley Act, informally referred to as Sarbox or Sox, is an attempt by the federal government in the United States to legislate several of the principles recommended in the Cadbury and OECD reports. Organizations should recognize that they have legal, contractual, social, and market driven obligations to non-shareholder stakeholders, such as employees, investors, creditors, suppliers, local communities, customers, and policy makers. Organizations should clarify and make publicly known the roles and responsibilities of board and management to provide stakeholders with a level of accountability. They should also implement procedures to independently verify and safeguard the integrity of the company’s financial reporting. Disclosure of material matters concerning the organization should be timely and balanced to ensure that all investors have access to clear, factual information. Most codes are largely voluntary. An issue raised in the U.S. since the 2005 Disney decision is the degree to which companies manage their governance responsibilities. In other words, do they merely try to supersede the legal threshold? Or should they create governance guidelines that ascend to the level of best practice? The Sarbanes–Oxley Act is a US federal law enhancing standards for all US public company boards, management and public accounting firms. As a result of SOX, top management must now individually certify the accuracy of financial information. SOX increased the independence of outside auditors who review the accuracy of corporate financial statements, and increased the oversight role of boards of directors. The Sarbanes–Oxley Act includes Auditor Independence, Corporate Responsibility, Enhanced Financial Disclosures, Analyst Conflicts of Interest, Commission Resources and Authority, Corporate and Criminal Fraud Accountability, Corporate Tax Returns, and Corporate Fraud Accountability..
external auditor: An external auditor is an audit professional who performs an audit in accordance with specific laws or rules on the financial statements of a company, government entity, other legal entity or organization, and who is independent of the entity being audited. conflicts of interest: A conflict of interest (COI) occurs when an individual or organization is involved in multiple interests, one of which could possibly corrupt the motivation for an act in the other. The Sarbanes–Oxley Act of 2002 is a United States federal law that set new or enhanced standards for all U.S. public company boards, management and public accounting firms. The act is also known as the “Public Company Accounting Reform and Investor Protection Act” (in the Senate) and “Corporate and Auditing Accountability and Responsibility Act” (in the House). 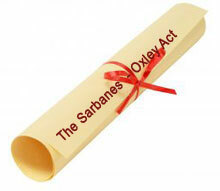 It’s more commonly called Sarbanes–Oxley, Sarbox or SOX; it is named after sponsors U.S. Senator Paul Sarbanes (D-MD) and U.S. Representative Michael G. Oxley (R-OH). As a result of SOX, top management must now individually certify the accuracy of financial information. In addition, penalties for fraudulent financial activity are much more severe. Also, SOX increased the oversight role of boards of directors while also increasing the independence of outside auditors who review the accuracy of corporate financial statements. Sarbanes-Oxley Act: SOX is a United States federal law that set new or enhanced standards for all U.S. public company boards, management and public accounting firms. The bill was enacted as a reaction to major corporate and accounting scandals affecting Enron, Tyco International and others. These scandals, which cost investors billions of dollars, shook public confidence in the nation’s securities markets. Debate continues over the perceived benefits and costs of SOX. Opponents of the bill claim it has reduced America’s international competitive edge against foreign financial service providers, saying it introduced an overly complex regulatory environment into U.S. financial markets. Proponents of the measure say that SOX has improved the confidence of fund managers and other investors with regard to the veracity of corporate financial statements. Title I consists of nine sections and establishes the Public Company Accounting Oversight Board, providing independent oversight of public accounting firms. It also creates a central oversight board tasked with registering auditors, defining the specific processes for compliance audits, inspecting conduct and quality control, and enforcing compliance. Title II consists of nine sections and establishes standards for external auditor independence. It also addresses new auditor approval requirements, audit partner rotation and auditor reporting requirements. It restricts auditing companies from providing non-audit services (e.g., consulting) for the same clients. Title III consists of eight sections mandating that senior executives take individual responsibility for the accuracy and completeness of corporate financial reports. It defines the interaction of external auditors and corporate audit committees, and specifies the responsibility of corporate officers for the accuracy and validity of corporate financial reports. Title IV consists of nine sections. It describes enhanced reporting requirements for financial transactions, including off-balance-sheet transactions, pro-forma figures and stock transactions of corporate officers. It requires internal controls for assuring the accuracy of financial reports and disclosures, and mandates both audits and reports on those controls. Title V consists of only one section, which includes measures designed to help restore investor confidence in reporting of securities analysts. It defines the codes of conduct for securities analysts and requires disclosure of knowable conflicts of interest. Title VI consists of four sections and defines practices to restore investor confidence in securities analysts. It also defines the SEC ‘s authority to censure securities professionals from practice and defines conditions under which a person can be barred from practicing as a broker, advisor, or dealer. Title VII consists of five sections and requires the Comptroller General and the SEC to perform various studies and report their findings. Studies include the effects of consolidation of public accounting firms and role of credit rating agencies in the operation of securities markets. Title VIII consists of seven sections and is also referred to as the “Corporate and Criminal Fraud Accountability Act of 2002. ” It describes specific criminal penalties for manipulation, destruction or alteration of financial records, or other interference with investigations, while also providing certain protections for whistleblowers. Title IX consists of six sections. This section increases the criminal penalties associated with white-collar crimes and conspiracies. It recommends stronger sentencing guidelines and specifically adds failure to certify corporate financial reports as a criminal offense. Title XI consists of seven sections. Section 1101 recommends a name for this title as “Corporate Fraud Accountability Act of 2002. ” It identifies corporate fraud and records tampering as criminal offenses and joins those offenses to specific penalties. It also revises sentencing guidelines and strengthens their penalties.